This recipe for Jewish cheese blintzes is a similar type of pancake as French crepes, Polish nalesniki, Hungarian palacsinta, and Serbian palacinke. Unlike the thick, fluffy traditional pancakes that Americans have come to love and enjoy for breakfast, these pancakes are very thin and can be stuffed with various sweet or savory fillings, making them a unique vehicle for a variety of flavors. Ideal for breakfast, lunch, or dinner, they can be as filling as you make them. Due to their texture, they can be made ahead of time and frozen before use. Just complete all of the steps up through filling them, but make sure to skip frying. When you're ready to enjoy them, fry them in butter while still frozen. If you don't want to use ricotta cheese but can't find dry curd cheese, you might want to try making your own farmer's cheese from scratch. It's easier than you might think! 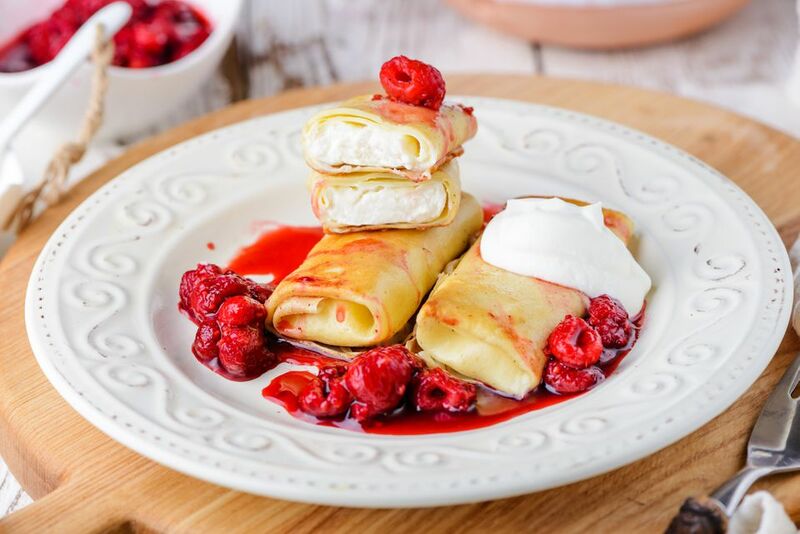 Note: while there are multiple steps to this recipe, this blintz dish is broken down into workable categories to help you better plan for preparation and cooking. In a medium bowl, beat together 4 eggs, water, milk, salt, and flour until well-mixed. Don't over-beat. It's okay if small particles of flour remain as they will be absorbed during the resting period. Let the batter rest at room temperature for at least 30 minutes. Heat a small skillet (about 7 inches in diameter) and add a pat of butter. Whisk the batter until smooth. Pour about 1/4 cup batter into the pan and swirl it around, pouring off excess. Make sure not to let it brown. Flip and cook the other side for a few seconds. Then, turn the blintz out onto a towel. Repeat with remaining batter and pats of butter, staggering the crepes one on top of each other. In a large bowl, mix together cheese, melted butter, 1 egg yolk, vanilla, and sugar until well-incorporated. To assemble, place one blintz on a work surface and place 1 to 2 tablespoons of filling in a line close to the edge nearest to you. Roll up, and continue with remaining blintzes and filling. Fry the filled blintzes in butter until golden brown. Serve with optional sour cream and/or fresh or canned fruit toppings. Enjoy!